A Popliteal cyst, better known as a Baker’s cyst, is a swelling filled with fluid that is located in the popliteal fossa region. Ganglia which are benign cystic tumors, originate from synovial tissue. It can occur mostly at the wrist, hand, foot, and knee which is known as popliteal cyst. The cyst can exercise pressure on some anatomical structures, in most cases, the affected anatomical structure is the popliteal vein. Which can develop into thrombophlebitis. A Baker’s cyst is an enlarged bursa that is normally located between the medial head of the gastrocnemius and a capsular reflection of the semimembranosus, named oblique popliteal ligament. The two requirements for a cyst formation are the anatomical communication and a chronic effusion. Knee joint effusions may replete the gastrocnemius-semimembranosus bursa with synovial fluid and if the fluid outflow is hindered by a unidirectional mechanism, the gastrocnemius-semimembranosus bursa enlarges giving rise to a pseudocystic cavity, referred to as a Baker’s cyst. A Baker’s cyst, or a popliteal cyst, occurs if there is an underlying intraarticular problem with the knee or and inflammatory reactions, commonly as a result of losing bodies formed in conditions such as osteoarthritis, rheumatoid arthritis, ACL tears, meniscal tears or because of particles following knee arthroplasty, mostly from the polyethylene liner. Primary Cyst: An expansion arising independently from the joint and there is no knee derangement. The cyst can vary in size, from a very small (asymptomatic) to a large one but a change in size is very common. Especially in smaller cysts a septum may exist separating the semimembranosus and gastrocnemius components. This may function as a flap valve allowing fluid to enter a popliteal cyst and not to exit it. Popliteal cysts can give pressure against other anatomic structures. Compression of the popliteal artery or vein can cause ischemia or thrombosis, respectively, whereas compression of the tibial or peroneal nerve can cause peripheral neuropathy. A ruptured cyst can manifest as calf pain or even swelling, it can also cause an itching feeling in the calf. There are more common in patients with an inflammatory pathology than in patients with a degenerative pathology. Differential diagnoses of mass in the calf muscle. Precise differentiation of the patient’s symptoms can be located by ultrasonography. If the popliteal cyst becomes infected, this can often result in a painful mass behind the knee. In such cases, it could be difficult to make a diagnosis and the infected cyst can be mistaken for a neoplasm. The cyst can rupture (split open) resulting in severe calf pain, decreased motion at the ankle and cause similar symptoms as a deep vein thrombosis (evident on ultrasound or venogram). The imaging workup of knees with suspected popliteal cysts can include plain radiographs, arthrography, ultrasound, and MRI. Early in the evaluation it can be useful to obtain plain radiographs (as posteroanterior Rosenberg, lateral, and patellofemoral axial views) for detecting other conditions found in association with popliteal cysts, such as osteoarthritis, inflammatory arthritis, and loose bodies. In addition, loose bodies may be seen in a Baker’s cyst on plain radiographs. At first, direct arthrography was used for detecting popliteal cysts. Direct arthrography involved intra-articular injection of the knee with gas or an iodinated contrast medium, followed by mobilization of the joint to force the contrast into the cyst. Afterwards, spot radiographs or fluoroscopy were used to detect the presence of the contrast in the cysts. The disadventages of this technique include the use of ionizing radiation and the use of invasive techniques to inject the contrast. The advantages of ultrasound provide a replacement of arthrography by ultrasound. The advantages are its low cost, noninvasive usage and the absence of radiation. The main disadvantage is the fact that it is user dependent. Ultrasound is able to detect Baker’s cysts near 100% but lacks to differentiate from other conditions, such as meniscal cysts or myxoid tumors, it also doesn’t visualize other conditions in the knee that are often associated with these cysts. 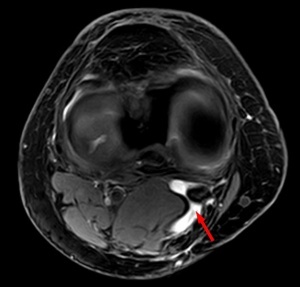 Conditions such as meniscal cysts are more easily differentiated from Baker’s cysts with MRI than ultrasound. This may be the gold standard but is also a high-cost technique, therefore, ultrasound should be considered as a screening modality if the evaluation of the intra-articular structures is not necessary. Outcome measures are used to determine and evaluate the expected results of the therapy/procedure to be compared to the results found within the patient. The examination is more of clinical observation and ruling out other possible conditions. If infected or severe conditions, radiological investigations may be helpful. Patients with a Baker’s cyst commonly have symptoms of meniscal or chondral pathology which can be tested by McMurray test. Symptoms related to a popliteal cyst are rare. If these symptoms are present, they may be related to the size of the cyst and include posterior or posteromedial fullness and achiness, mass and stiffness. The most common symptoms are popliteal swelling and posterior aching. Patients may also complain of pain that occurs with terminal knee extension. During the examination testing of knee flexion can be useful. 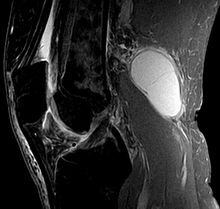 Patients with large cysts may develop loss of knee flexion because the cysts mechanically block flexion. The examination will often reveal knee meniscal or chondral pathology, there can be palpable posteromedial fulness or tenderness. A palpable cyst is often firm in full knee extension and soft in knee flexion. This finding is known as “Foucher's sign” and is due to cyst compression. With extension, the gastrocnemius and the semimembranosus muscles approximate each other and the joint capsule compressing the cyst against the deep fascia. The mechanism of Foucher’s sign is useful for distinguishing Baker’s cysts from lesions such as popliteal artery aneurysms, adventitial cysts, ganglia, and sarcomas, for which the palpation of the mass is unaffected by the knee position, therefore this is considered the test for finding a Baker's cyst. Sometimes no treatment or simple supportive measures lead to spontaneous resolution or to a reduction of the symptoms. If this does not happen, invasive and surgical techniques may be an option. The asymptomatic popliteal cyst often gets better and disappears by itself over time. If symptomatic, rest can temper the pain that bursa is causing, take non-steroidal anti-inflammatory drugs (NSAID) to alleviate the pain and restrict movement, also alternate with ice. If the pain persists, a subsequent steroid injection with a solution of anesthetic and steroid can be advised which can relieve pain, but not prevent recurrence of the cyst. It’s only a temporary solution.By a popliteal cyst of inflammatory origin, it is enough to treat the underlying disease. When the underlying disease doesn’t get treated, the Baker’s cyst can come back. Arthroscopic examination should be performed and all pathologic conditions treated before considering the excision of a popliteal cyst. The cyst can be removed with surgery if it becomes very large or causes symptoms such as discomfort, stiffness or painful swelling. There are three surgical techniques available to treat the cyst: common posterior approach, the posteromedial approach, and the medial intra-articular approach. The first two techniques are techniques where the cyst is going to be removed. In the last technique, they make an opening in the cyst and close it afterward. The popliteal cyst will eventually disappear. An ice massage of 15 minutes every 4-7 hours will reduce the inflammation. The treatment is based on the principles of R.I.C.E (rest, ice, compression, and elevation) followed by some muscle-conditioning exercises. A rehabilitation program can improve the control of the knee joint by range of motion exercises. It will increase the motion of the joint as well as increase flexibility. The physiotherapist will give a mobility, a hamstring stretching program and a concurrent quadriceps strengthening program that has to repeat several times a day. This will result in less pain at about 6-8 weeks. There is an experiment comparing ultrasound guided corticosteroid injections with a horizontal therapy. 60 people were divided in three groups, only injections (group A), only horizontal therapy (group B) and (group C) they got both the injections and the horizontal therapy. The horizontal therapy was delivered through a specific commercial device, and they followed the instructions, provided by the manufacturer. Patients in groups A and C had a lower level of pain after one month. Group C had the lowest VAS scores and group C also scored best on the WOMAC. In group B and C the stiffness and disability scores were also improved the most. Baker’s cysts have different causes, therefore finding one solution is difficult. The most common treatments are invasive, such as corticosteroid injections and NSAID or surgery. When the pain is worse, an injection can help to relieve the pain. However, it cannot ensure that the cyst will not come back. Often the cyst disappears by itself. However, this is not always the case. A patient who has a lot of pain from the Baker’s cyst may use ice or NSAID, in order to reduce the pain. At this stage, there is a need for more research on physical therapy, applied on Baker’s cyst patients. ↑ 5.0 5.1 5.2 Bowen, D., Gill, J. R., Pulido, P. G., Melton, J. T. K., & Cross, M. An Anteriorly Presenting ‘Wrap Around’Popliteal Cyst. Archives of Bone and Joint Surgery.2018; 6(5): 420. ↑ 6.0 6.1 6.2 6.3 6.4 Herman, A. M., & Marzo, J. M. Popliteal cysts: a current review. Orthopedics. 2014;37(8):678-684. ↑ 7.0 7.1 Constantinou, M., & Vicenzino, B. Differential diagnosis of a soft tissue mass in the calf. Journal of Orthopaedic & Sports Physical Therapy.2005; 35(2):88-94. ↑ Canoso, J. J., Goldsmith, M. R., Gerzof, S. G., & Wohlgethan, J. R. Foucher's sign of the Baker's cyst. Annals of the rheumatic diseases. 1987; 46(3): 228.